This was a really fun project: our good friend Chris was turning 30 and commissioned me to create an design for the event in the style of a concert poster. In the end, Chris really enjoyed the poster, as did the attendees of "Chris-Ma-Geddon" who purchased a print of it, and I got to have a lot fun letting my imagination run wild. My process for this piece: Thumbnail Sketches to Rough Lineart to Colour Studies to the Finished Piece. Chris really liked the muted colour scheme while I leaned more towards the more vibrant colours, but you have to go with what your client wants and the poster turned our great! I wanted to make my wife something special for Christmas, knowing that this year we will be announcing our first child is on the way to family and friends. I saw a bunch of postings depicting these phrases, and I wanted to give them my own touch and style to it. For me, I love Star Wars and the classic look of Obi Wan's lightsaber. For her, she loves Harry Potter and I went the extra step to recreate her customized Pottermore wand (Hazel wood with a Phoenix feather core, 12 3/4" and slightly springy) Needless to say, she was very surprised and the plaques are hanging in Alistair's room right now. I have been practicing Wing Chun Kung Fu for nearly 5 years now. It's a wonderful art full of a lot of subtly, science and self-discovery. My Sifu commissioned me to create a plaque design to honour the completion and certification of our school's Wing Chun system by its first 2 instructors. After a number of discussions and revisions, the final version turned out great and the instructors really loved the design. I put this together for a couple who are just as big a pair of nerds as my wife and I. They wanted to announce their first child on social media and to be able to print out and hang on their wall. The two arms of the heart representing them: their favourite game consoles and their love of gaming that brought them together. The Wii Remote in the middle represents their child; a step-forward into the future while building on what was already there. This was a fun project and they really loved it. I took it upon myself to design the wine labels for the wedding. It took a while and we went through many revisions, but I got a lot of practice with Procreate and the end result was great. The wine inside the bottle was pretty good too! Simple and elegant Event Program and Dinner Menu for the wedding and reception. Everyone enjoyed the design but they really couldn't get enough of the food! We had chosen to make our kissing game based on one of our favourite past times: trying to figure out where a certain quote is from. The labels were made to help describe the game and to look charming while doing so. The game was a big success with all of the guests! 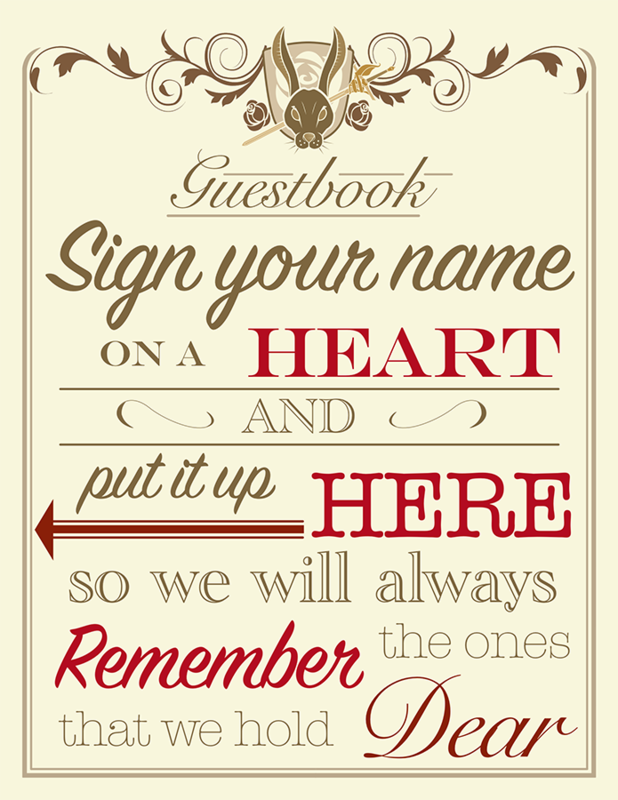 We needed a nice little sign to help guests figure out how to sign our unique Guestbook. We got a lot of hearts and a wonderful piece of art for our walls. My entry into a Mega Man fanart contest held by Capcom. It was a fun little piece to a series that played a big part of my childhood.